Unless you're hiding under a social media rock lately, you'll have seen the huge scandal that erupted after Clarks released their new school shoes with quite obviously sexist names to suit. The boys range were named 'Leader' whilst the girls seemed to appear quite inferior by being called 'Dolly babe'. And whilst I wholeheartedly agree that both of those are terrible names, they are sexist and give very unjust gender stereotypes. I can't help but feel a little miffed that all of the other glaringly obvious negative connotations towards little boys, appear to get overlooked? It's a topic I do feel hugely passionate about, because it's one I think I can see from both sides of the fence. Though it's important to realise that this isn't pitting boys against girls, and I'm all for men and women doing whatever the hell they like, no matter how far it pushes the gender constraints. But as both a woman myself and a mother to two boys, I feel as though I'm surrounded by blatant negative stereotyping of little boys and it drives me insane. 'Who cares about a slogan on a t-shirt' you might think, 'it's just a t-shirt'. They are words, and as soon as your child can read they'll know what it says and for me I think it enables a self fulfilling prophecy. You wouldn't tell your child they're wild, naughty or terrible every day - so why on earth is it printed on t-shirts, pyjamas and other clothing aimed at little boys. You only have to walk into your local supermarket to be bombarded with 'Mummys Menace' t-shirts placed firmly in the boys section, sitting pretty opposite a 'Daddys little princess' t-shirt in amongst the girls, it's wrong and it's unjust. It doesn't end at clothing either, picking up classic childrens story books, Jack and the Beanstalk - Jack is naughty for selling a cow, and the mean greedy giant is a boy. Mr Men books, Mr Messy, Mr Mischief, Mr Silly and Mr Bump. Even modern Tv Shows now aimed at children, Fireman Sam still features Normal, the naughty arsonist who is always causing trouble, and Horrid Henry - need we say more? If I can pick up on all of these things, my boys sure as hell will when they read and watch them as they grow, but why is it acceptable? Of course as a Mother of boys I know all too well of their pitfalls, I see the wee on the seat and I hear their vivacious roars from the living room as I cook their lunch, but I don't think that would differ if I had two girls in my household. I'm a woman, I know what trouble we can cause and I'm certain I own just as many abhorrent characteristics as they would in twenty years. I'm part of many parental groups on Facebook and seeing the question posed many times 'Are boys worse than girls or is it just me because my little boy....' and a tangent begins listing the noxious behaviour of their sons, my retort is always the same - I don't believe any child is worse than another due to their gender, if anything, their place in the Family would be more of a reflection upon their behaviour as I'm certain it is in our household. Patrick is a menace, an absolute menace, he winds Noah up, snatches, tantrums and acts like a top level diva. Not because he's a boy, but because he is the second child and he has someone to do all of those things too. Noah was our first, also a boy but an absolute dream, your textbook child and why? Simply because he has nobody else to irk, had he been our third or fourth child, I'm confident he'd be a different boy. It brings me back to the original point, Clarks. Yes, we all know it's wrong, it's mildly infuriating that they've named a variety of shoes the ridiculous names, but, is it instilling it into those children? As soon as you've purchased the shoe that's it, forgotten about and done with, your child wouldn't even have to know the name. Yet it's a huge scandal, when in comparison, shops every single day display and sell such negative labelling aimed at little boys. I truly believe in the self-fulfilling prophecy in the respect that if you tell children they're bad, naughty, cheeky and silly enough, they'll believe they are, thus acting out in a way. Why try to break the label of something everyone things you are anyway? I totally agree that people are so focussed on eradicating sexism against little girls that little boys' stuff gets overlooked. We should absolutely be bringing our girls up to know that they can be whatever the hell they want. It's infuriating that boys are still told they need to be loud, and play with cars... the worst t-shirt I saw was "Daddy's little wingman". If we're going to address negative stereotyping it has to be across the board! Love this post, I think you are totally right that gender sterotyping is everywhere, often very subtly. My first thought when I heard about the scandal was why do the shoes even have a name? What's wrong with a product code like everything else. I always look at the boys and girls section for clothes for my daughter as if I like something in the boys section I'll buy it. 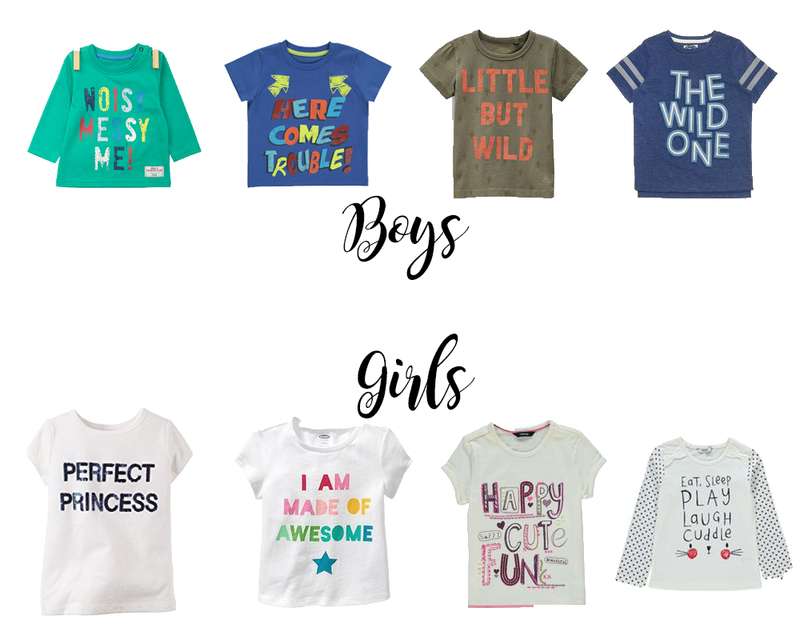 I always avoid the gender stereotype slogan tshirts for my boys - it is crazy that in today's world there are still such ridiculous cliches.